Morten E. Solberg is acknowledged as a Master Artist. He is versatile in all mediums. He paints in oil, acrylic and watercolor and his techniques range from photo-realism to total abstraction. Mort has spent over 50 Years of pursuing his passion. Before moving West in 1968, Mort attended The Cleveland Institute Of Art nights, studying painting and design. He shed his commercial ties and concentrated on fine art and has been painting full time since 1970. 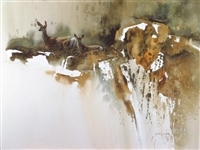 After moving to Southern California’s Orange County in 1968, he firmly established himself in the art world with memberships in the American Watercolor Society, the National Watercolor Society, the Society of Animal Artists, Wildlife Artists of the World, Knickerbocker Artists and the Society of Master Impressionists, as a lifetime Master member and a signature member the American Society Of Marine Artists. Culture holds a special allure for Mort, perhaps because his great great grandmother was Native American. Norwegian whalers & explorers are among his ancestors. Wildlife, romantic women with parasols, flowers, fisherman, sporting and nature have provided him with endless design opportunities. Mort and his wife, Terri, have three adult daughters: Brandalyn, Monet and Tauna. Mort has three adult sons. Mort Jr., Eric, and Scott. Mort and Terri and Tauna their youngest daughter moved to Bluffton, SC in December of 2015 . Mort’s interests are many and varied and they are often reflected in his art.